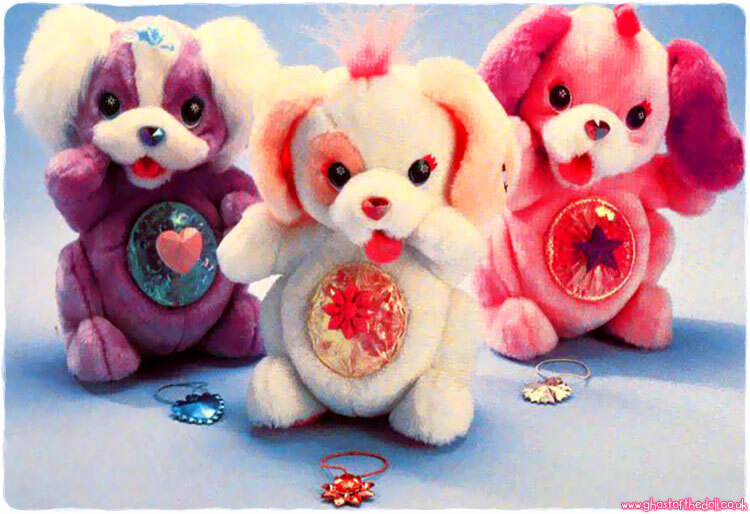 "Once upon a time in a magic pet shop, there lived six Fluppy dogs, each with a pom-pom nose, satin bows and fun-to-tie-up hair. 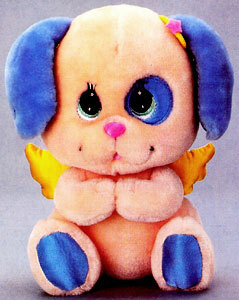 A snuggly soft fluppy dog wants to be your best friend." 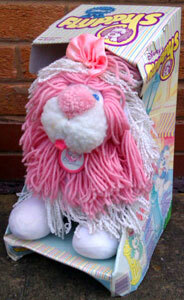 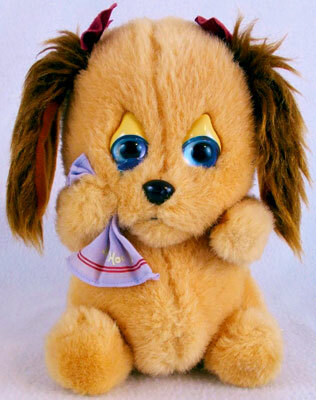 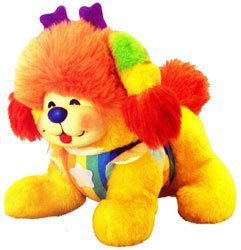 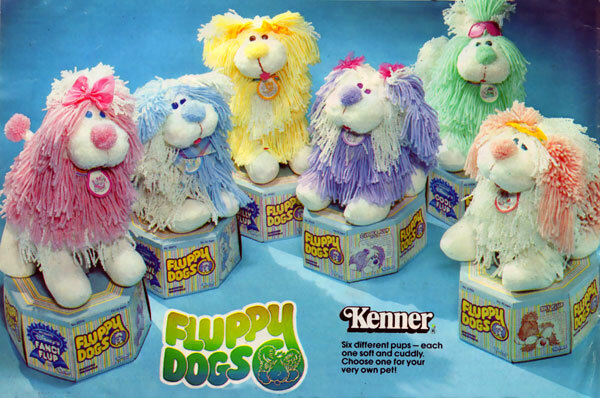 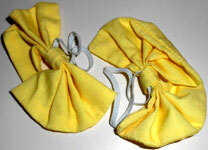 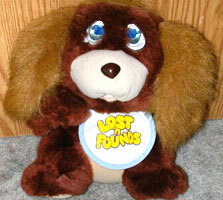 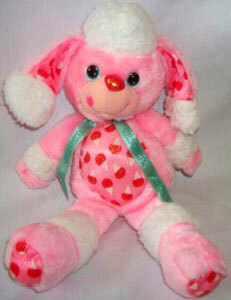 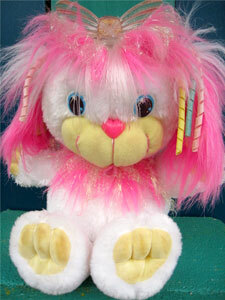 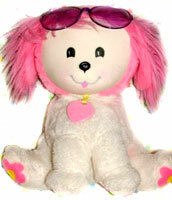 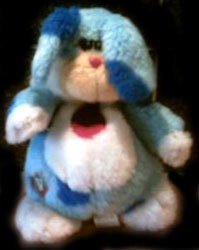 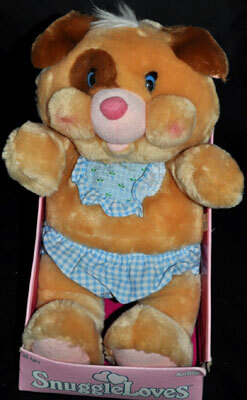 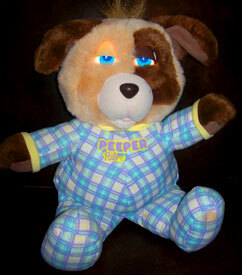 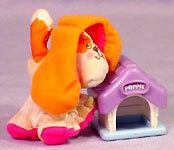 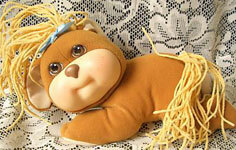 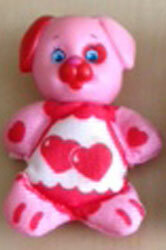 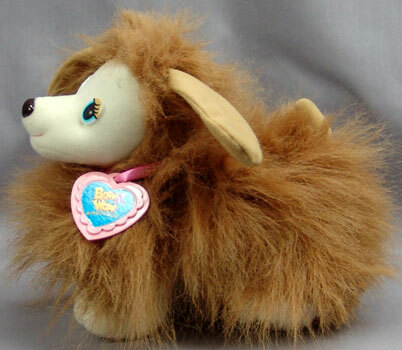 Fluppy Dogs began life as a Disney animation in 1986 and quickly turned into plush toys produced by Kenner. 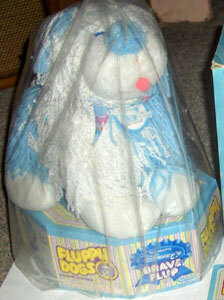 Along with the dogs & puppies there were also fashions sets & accessories, books and various other items. 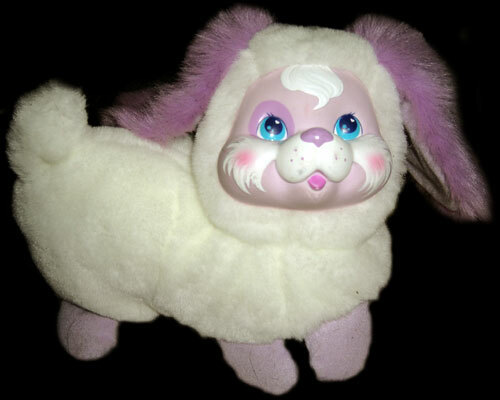 The line was due for expansion in 1987, but it never happened. 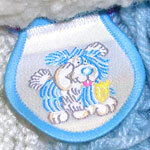 View all Fluppy Dogs on eBay.com or eBay.co.uk ! 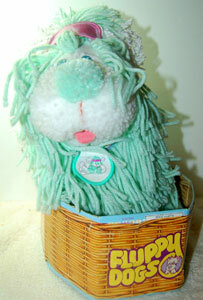 "Pettable, huggable Fluppy Dogs are the shaggy stuffed animals covered from head to tail with two kinds of yarn colours and textures. 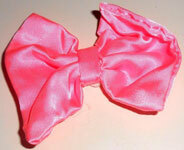 You style them in the latest fashion or any way you please. 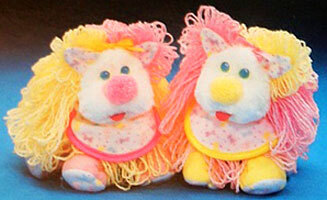 just look at those adorable pom-pom noses. 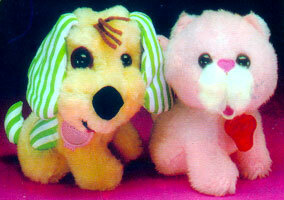 Each one has distinctively different eyes, ears and tail colouring too! 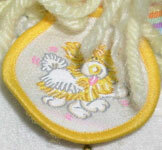 Individual medallions show their true canine personalities." 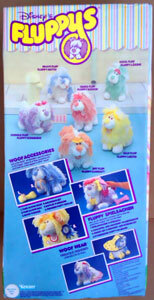 The five original Fluppy Dogs from the Disney animation plus one more (Fanci Flup) were created as large 16" plush toys with yarn hair. 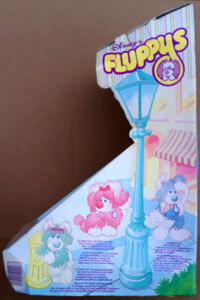 They also had different names from the film. 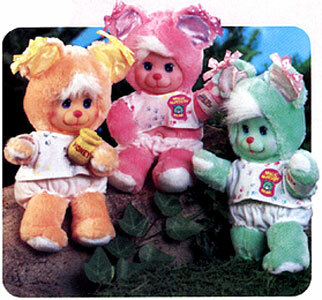 There were six new adults due for production in 1987, but it never happened. 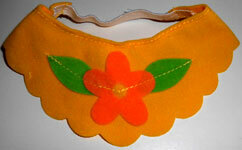 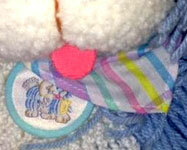 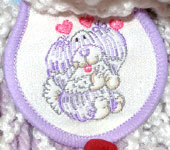 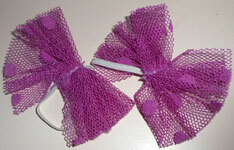 Each dog came with an embroidered collar tag and one head accessory. 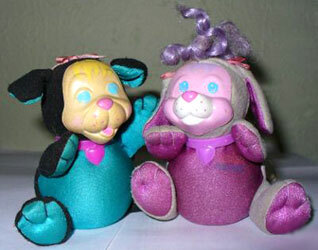 There were two kinds of packagings produced. 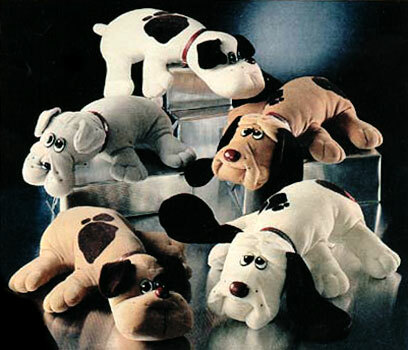 The first kind could be made into a dog basket by turning it upside down, pushing in the flaps and wrapping it in the basket paper provided (the puppies were also sold with the basket packaging). 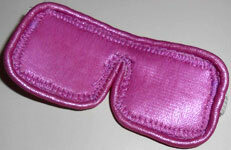 The second was the more traditional open boxed type. 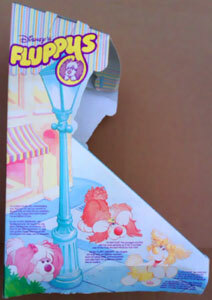 The basket packaging was labeled "Fluppy Dogs", whereas the open box packaging was labeled "Fluppys" and looks to be German.